But if you do want to keep your teeth and have a gorgeous smile in all your travel photos, how do you choose the best travel toothbrush from all those many different models? You Play It Simple. Practical. Hygienic. And If There’s Extra Room For Technology, So Be It! And allows safe airy storage. Everything else is a matter of preference. Coming up next, we’ve rounded up 8 of the most popular models currently on the market, backed up by Philips, Oral-B and, of course, Colgate. From the best travel electric toothbrush to the best manual toothbrush, one of them will be the one for the many travels ahead of you. Here’s our TOP 8 – Best Portable Toothbrush Selection! Not brushing your teeth is pretty much like smoking. Everybody tells you it’s bad for your health but you don’t believe it until you start experiencing all those problems. What could possibly go wrong if you go easy on brushing your teeth while traveling? That’s right, dental care can be painfully expensive and the number of people who flock to other countries searching for more affordable dentistry work is poised to soar. Go ahead and invest in the best portable electric toothbrush out there or even the best manual model and save money for more pleasurable activities. Do you normally pack just about half of your belongings, everywhere you go? I know it’s easy to throw in all those useless things and I know you’re absolutely convinced you might need it… STILL, don’t forget your travel toothbrush. Are you obsessed with light packing and worry-free traveling? Me too! And so, I know that irresistible desire of cutting the handle of the toothbrush just to make the backpack lighter… STILL, never ever consider ditching the toothbrush altogether. 1. The Common Dilemma – Best Travel Electric Toothbrush vs Best Manual Toothbrush? It’s not just that they look, feel and work completely different, but they also come with significant price differences. Many people are not sure if they should invest more in a battery powered travel toothbrush or settle for the best manual toothbrush. If you ask us, taking good care of your teeth comes down to brushing the right way. Unless you’re sloppy, this can be done with a manual model almost as easily as you do with an electric model. Receive real-time feedback and guidance on applying the right pressure. In case it gets lost or deteriorated during transport, you’ll be very upset about this loss. Will be more careless with it and even tend to forget it in different places more often. 2. Does It Really Have To Be A Folding Travel Toothbrush? This is another common criterion that people use when selecting the best travel toothbrush. The reason would relate to portability because, as a travel accessory, your toothbrush has to take up as little space as possible. To answer your question, no, it doesn’t really have to be a foldable model. Yet if it is, it could be better for you. Once you’ll go through our best portable toothbrush selection, you’ll notice that some folding models come with a special, double-function mechanism. More precisely, half of the brush, which normally acts as a handle when you keep it unfolded, will cover the brush and its bristles as a protective cap, once you fold it. If you’re into versatile and smart designs, this double function might please you. Then again, 5 inches instead of 10 inches might not make a huge difference to your luggage. Moreover, a simple cap could make up for the lack of a folding design and cost you significantly less. Of course, this question would rather apply to the best manual toothbrush because electric models normally come with their own case. 3. So, What, Now You Have To Look For The Best Toothbrush Travel Case? Ideally no, because just like we mentioned, your travel toothbrush kit should have a case included! So, this question isn’t necessarily about having to purchase a separate case but rather about the importance of having a case or a cap. If you recall the beginning of our review, hygiene is of the essence, especially because you’re traveling and you’ll have to keep such personal items in places that were cleaned up by other people. When you don’t have much control over the environment, you need control over your belongings. With the right protective cap, with air holes and a tight closing mechanism, your best travel toothbrush will dry out easily. That way, you can be sure that bacteria will not give a party on your brushes’ bristles. Plus, you won’t have to walk around with messy brushes in plastic bags. Now, do we need to say more or we can move on to the compact, ergonomic, and catchy models we’ve picked up to recommend you? The brush itself weighs as little as 1 pound and measures 1.7 x 1.7 x 7.3 inches. It packs an upgraded Li-Ion battery that can last up to 3 weeks and it works at 110-240 Volts. Add to all these the famous sonic technology with up to 31,000 brush strokes per minute… And you have one of the best portable electric toothbrush models out there! The Quadpacer will tell you, every 30 seconds, to move on to the next quadrant of the mouth. Features an ergonomic design, with a special, comfortable grip, and bristles change color when you need to replace the head. With so many available heads and different names, some buyers can easily get confused regarding what toothbrush and head combo to order. And a series of longer, sweeping bristles that would go deep between the teeth. The Oral-B Deep Sweep Toothbrush may seem quite similar to the Sonicare battery powered travel toothbrush, with a few differences. While it also has an in-handle timer that guides you on brushing for 2 whole minutes, it features only one intensity mode. And the rechargeable battery, when used for 2 minutes, twice a day, will last around one week. As a novelty, it comes with this fancy pressure sensor that lights up whenever you tend to overbrush, telling you to put less pressure on your teeth! Guides you to proper brushing with its 30-second vibrations that dictate when to change quadrants. Only one intensity mode and somewhat limited battery life. With the GUM On-the-Go, we step aside from the above electric toothbrush carry on models. This is, however, one of the best manual toothbrush options we could find, falling within a very tempting price range, and with two essential benefits: it’s a folding travel toothbrush with a double-function, tri-fold design. Long story short, the brush folds and unfolds, with the cap serving both as a handle – when you brush your teeth – and as a travel case – when you’re done and you want to pack it. This GUM On-the-Go will give you both the convenience of compact packing and the ease of mind that your toothbrush is kept hygienic and your backpack clean. Another great plus of this best portable toothbrush is the patented antibacterial agent of its bristles. The brush head is coated with special bristles that don’t just clean deep between your teeth, but that also inhibit the growth of germs while you’re not using it! The price is very attractive for the provided brushing quality. The bristles will tend to catch on the edge, when folding it, after extended use. Back to one of the best travel electric toothbrush options, we have this Oral-B Genius Pro 8000. Another kit from Oral-B, this battery powered travel toothbrush will take you to a completely new level! For starters, the kit includes the handle and the charger, 3 special brush heads, a refill stand, and a travel case with a smartphone holder. It weighs a little over 13 ounces and the Lithium-Ion battery should hold up for 12 days, all of which are making it seem slightly superior to the previous Oral-B Deep Sweep Toothbrush. The Bluetooth technology and the real-time feedback on brushing techniques and modes. The bristles have this 16-degree angle, criss-cross disposal for profound tooth-by-tooth clean. There seem to be some complaints regarding the functionality of the Bluetooth and the dedicated apps. This Philips Sonicare DiamondClean Smart Electric model is keeping the competition tight with Oral-B, bringing in the second Philips travel battery toothbrush in our top. 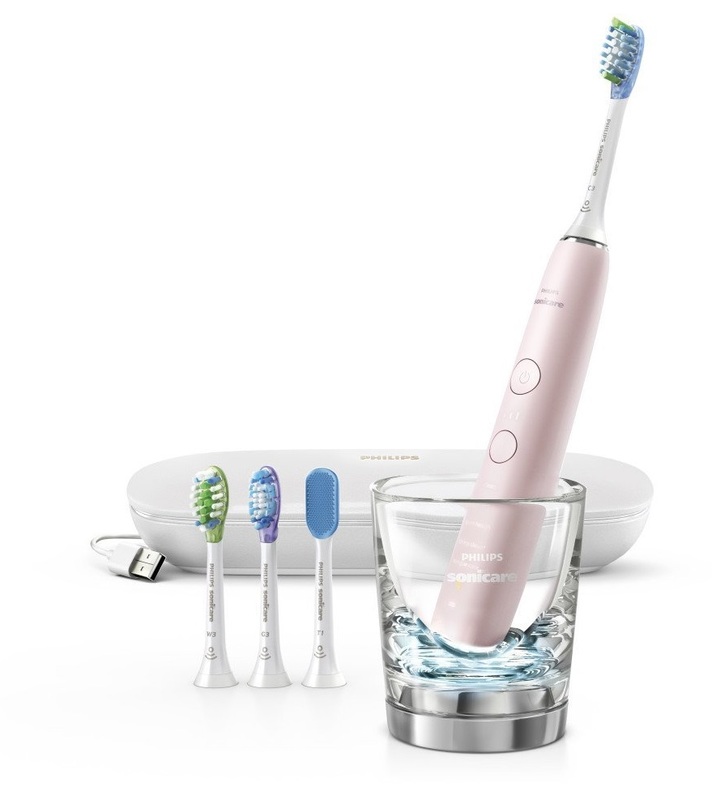 Much like the above Oral-B Genius Pro 8000, this one throws in a lot of goodies right from the starting package: the smart handle and 3 brush heads (for plaque control, gum care, and teeth whitening), the glass charger and a premium travel case with Bluetooth charging. To top it off, it works with a free app for iOS and Android, ready to personally instruct you on brushing your teeth, and its battery should last 14 days of two daily brushing sessions. The Philips Sonicare DiamondClean Smart Electric has 4 cleaning modes and 3 intensity levels that you can choose from. It also includes smart sensors that are giving you real-time feedback on how to improve your brushing technique. And it is designed with special care for style and functionality – like mentioned, it comes with a premium travel case and a sleek glass charger that looks pretty awesome. Smart mode pairing, brush head recognition, pressure sensors, and brush head’s effectiveness sensor are just a few of the smart features it boasts – if it won’t scare you away, it will probably make you call it your best electric toothbrush carry on. The waterproof, sleek and elegant design, together with all the accessories in the package, give you a well-intended premium feeling. And some buyers complained that customer support is not very responsive. 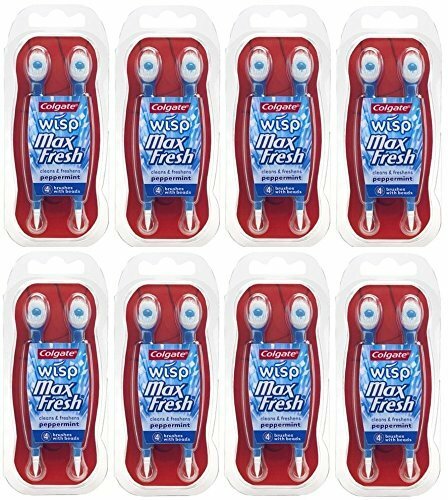 Colgate Wisp Max Fresh Portable brings in yet another famous toothbrush brand, next to Philips and Oral-B. As you would expect, this model, just like the two others remaining in our best travel toothbrush selection, is a manual toothbrush. We thought you might be looking for some super-simple alternatives as well and this is one of the best we could find: a set of 32 mini-brushes in 4 packs, readily flavored with peppermint, designed for single-use and throw away. Basically, you remove a Colgate Wisp Max Fresh Portable from its package, use it right away, without any water and without having to rinse in any way, and you throw it away when you’re done. Simple, clean, disposable mini-brushes that will give you a way out in any situation – what else could you want from your best portable toothbrush than such a disposable option? Comes at one of the most convenient prices on the market. Having them packed individually, not 4 in one package, would have been appreciated. 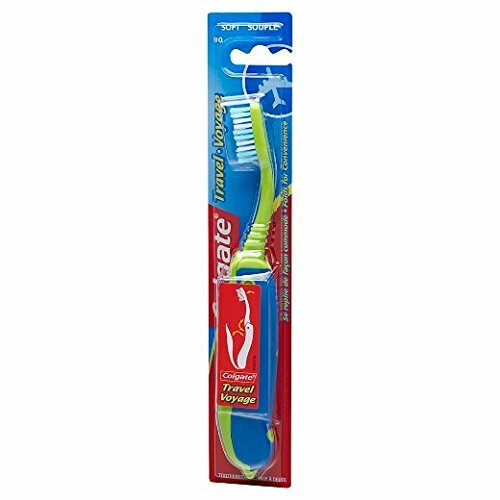 With this 0.2 ounces and 9.4 inches Colgate Value Travel Toothbrush you’ll have a hard time finding a more compact folding travel toothbrush! A great, small, and handy portable brush, with a special cover ready to act as your best toothbrush travel case, you can stop worrying and start smiling. Well-built, with a handle that feels nice in the hand and bristles that clean out really well. You might mistake this Colgate Wisp Portable Mini-Brush for the previous Colgate Wisp Max Fresh Portable yet, at a closer look, you’ll notice it’s a different deal. The same Colgate single-use mini toothbrush, but this time available in a smaller package of 16 brushes, with three flavors – Peppermint, Spearmint, and Cinnamint. The price per disposable brush is even more convenient and, if you don’t enjoy carrying a ton of brushes with you, a smaller batch like this one might serve you well. The Colgate Wisp Portable Mini-Brush comes in a slim shell package. And while it has 4 brushes in a pack, each one is individually sealed and easy to unseal. If you count the fact that one brush has about 3.5 inches, which is approximately as much as the keys in your pocket, you’ll see what it means pocket-sized. Attractive cost per single-use mini toothbrush. May not be the best choice for the eco-conscious buyers out there, who do mind throwing things after one use.